SEO is a battle. It’s a NEVER ending game. Believe it or not, the success of your website or blog largely depends on SEO. If you’re struggling to increase your overall organic traffic or sales, I’ve a quick tip for you: perform technical SEO. Why technical SEO is important? 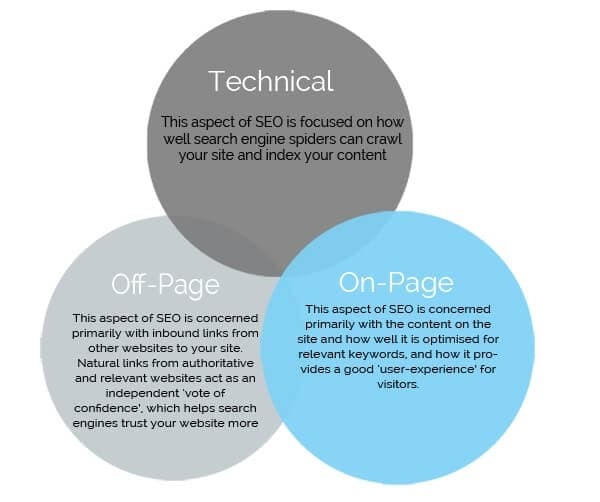 The following image explains what technical SEO is all about in a simple way, so have a look at it. Technical SEO helps you improve your website’s usability, search engine crawling and indexing. In a nutshell, technical SEO helps you boost your search engine rankings by increasing your site’s user experience and reducing your site’s SEO related issues. All in all, technical SEO improves your blog’s user experience by also giving you more search visibility. So let’s talk about how you can use technical SEO for better rankings and sales. Let’s dig into the details. No need of creating separate mobile friendly website. Because, if you create two websites one for desktop and another for mobile that has same content then Google penalizes for having duplicate content. Use responsive design so that site will easily viewable on different sizes of devices. It uses flexible images, flexible layouts and cascading sheet media queries. It will be able to detect visitor’s screen size and change the layout accordingly. The viewport meta tag tells your browser that page needs to fit the screen. The viewport is nothing but a visual area used by the browser that renders engine to determine how content is scaled and sized. So, include viewport meta tag, without this, it is not possible to get multi-device experience. Take care of Font sizes and button sizes. These two matters a lot for mobile devices. Keep the font size at least 14px so that users need not zoom while reading your content. It helps to adjust the font size for maximum legibility. Next, keep a large button, this is to ensure that users won’t abandon your site so quickly. Use high-resolution images. To ensure better user experience, just like on instagram, upload high resolution images on your site too. Remove Auto-zoom. The default zoom messes up images, layout elements, navigate content etc. Use viewport meta tag to set up custom variables within the content. Just include this tag in <head> HTML. Show YouTube videos for better SEO. The way users sees videos on mobile is different from desktop. The embed code on YouTube videos is already responsive so by using YouTube videos on your sites saves time. Give full site experience to users on mobile: Include “go to full website” or “view desktop version” at the bottom of your site. Never stop your potential customer from experiencing your full site. Test, Test, Test. Once you are done with creating responsive design, make sure you test the site. Test your site on Android platform, iPhone, Windows phone and other tablets too. If search engine robots can crawl and index your site’s pages than we say it as crawlability. If links on your site are not search engine friendly it means your site has extremely poor crawlability. It is very serious issue that it is very difficult to achieve search engine rankings if your site has poor crawlability. In order to know how search engine crawl your site, use Xenu’s Link Sleuth. If there are any pages that this tool is unable to reach then you can assume that search engine robots are not able to crawl those pages. Alternatively, you can also use site:yourdomain.com (for ex: site:bloggerspassion.com). It determines how many pages search engine have indexed. Let’s say you have 50 pages on your site and Google indexed only 10 of them, it means your site has a crawlability issue. If your site is built entirely on AJAX then use SEO spider tools, Screaming Frog and WebSite Auditor to check your site crawlability. Website speed matter a lot as Google rewards fast loading sites and ranks well. SO, if you want your site to show up in top search results then you should really start considering your website speed. #1. Before uploading images, adjust image size: If you use WordPress, then you can upload images at full size and adjust display size. But it’s not good practice as it executes multiple commands and slow down the site. Use image editing program to adjust images before uploading to your site. Open Microsoft Paint (Windows) or Preview (Mac) to open the image and resize it. Now after resizing each image, total file size will be so large and it will slow down your website speed. So, after resizing the image, take the compressor tool TinyPNG. Just click the link and upload your resized image and this tool will reduce the file size without reducing resolution. Now take this image and upload on your site. You image will look exactly the same and helps in loading your website faster. #2. Remove unnecessary plugins: There are so many plugins that are available for free. The more plugins you add, the more resources it uses and it slows down the website speed. If you observe that your site is loading very slow then perform plug-in run-through. Disable every plugin one by one and check your site with the tool GT Metrix. It will show you the site speed. If you see improvement in your site speed after disabling the plugin. Then remove that plugin permanently. If you need that plugin at any cost then find out alternative plugin with that functionality. Sometimes due to bad hosting service provider, your site speed goes down so, use the best hosting service provider. Did you ever ask yourself why that ‘S’ in HTTP? Yes, it stands for “SSL” which means Secure Socket Layer. It is the technology that encrypts your connection to a website. This is very important to prevent hackers from stealing info on your site. SSL helps to prevent “man-in-middle” attacks (a communication between two parties is monitored and modified by an unauthorized party). This is very important if yours is ecommerce website. AMP (Accelerated Mobile Pages) ready pages will have better ranking and Google is going to make it a priority in 2018. AMP requires SSL. Google is going to use it’s algorithm to index mobile version of a site to rank pages. But to index mobile site, Google recommends some practices. One of those is “migrate to a secure site”. So, HTTPS is preferred over HTTP. The one aspect that is often overlooked while implementing SEO strategies is website’s architecture. It is the approach which is used to design and plan your website, the way you organize your content in your blog. Don’t use dynamic URLs: Users don’t like lengthy parameters. And never frustrate users. Avoid session IDs: If you are adding a session ID for each user at the end of the URL then change that now. Because different URLs pointing to the same content indicates duplicate content. Redirect 302: If SEO matters to you, make 301 redirections. Because a 302 redirection may redirect the user to the new page but doesn’t transfer link juice.from your older version of page to newer version of page. Use proper anchor text: If your site has thousands of pages, then interlinking is highly useful and powerful. Instead of using words like “click here”, “more”, use target words as anchor text. Minimize the link depth on your site: Make sure that none of your page is deeper than 3 clicks away from your home page. This is important to make your site architecture flat. Because, deeper the page, less the link juice is passed. If less link juice is passed, Google drops the page from indexing. If any page doesn’t have minimal link juice then Google won’t consider that page while indexing. Right from the beginning of the site, take care of your website’s architecture. As poor website architecture face crawlability and indexing issues. Well, what if, if you can analyze how well the search engines crawl and access your website. Google Webmaster is one of the tools that helps you with all these details. Google Webmaster Tools (GWT) is one FREE technical SEO tool that has great features and ability to pinpoint the 404 errors. You need to pinpoint 404 errors that which doesn’t show up to website visitors. It’s important to redirect the 404 error page to the correct page because if not found, it will hinder your website’s marketing performance. This tool also allows you to check Robots.txt file which is a file on your website that prevents search engine from listing certain pages in search results. It makes sure that none of your web pages are being blocked from search engines. You can pick up duplicate page titles and descriptions and fix them in order to avoid ranking penalties by search engine. It also allows you to see whether your website’s sitemap is error free or not. It’s important to check this as a sitemap with errors can create unpleasant user experience to website visitors. Wanna make your site faster and mobile friendly? With Google pagespeed insights you can analyze your site and enhance it’s performance and it’s completely FREE tool. The pagespeed gives the score to a website ranging 0 to 100. If your website gets the score of 80 or above, it means your website is performing well. Bloggers Passion has a desktop score of 89 out of 100 and there are a certain recommendations given by the tool to improve its user experience further. Have a look at the screenshot below for better understanding. Well, pagespeed is different from site speed. Pagespeed is nothing but the measurement of how fast the content on your page loads or simply how much time the visitor have to wait until your page is loaded completely whereas site speed is the pagespeed for a sample of page views on a site. Website loading speed is one of the SEO ranking factors and is it is very important to give good user experience. Pagespeed insights gives you all the keys and suggestions to improve your page load speed. Screaming Frog is a tool that crawls your web pages the same way search engine does. It crawls each page and pulls out everything that hinders the performance. It’s great tool for both on-page SEO as well as technical SEO. If you are not using screaming frog for technical SEO then start using it because it helps you to highlight issues such as meta robots errors, duplicated pages on different URLs, internal redirects and much more. However, you can crawl up to 500 sites in free version and which is pretty fine for small sites. Here is how you can use Screaming Frog. Go to screaming frog and enter the URL that you want to check. If you want to crawl additional sub domains, you can do so by checking the ‘Crawl All Subdomains’ box under configuration > spider. Depending on the size of your website, process takes a couple of minutes. You can check all HTTP status codes and all URLs of a website to filter long length URLs. With SEOptimer, you can do SEO audit of any page.It provides step by step clear cut instructions like how to improve your website. SEOptimer tells you how your competitors are performing and where you are lacking. It’s a FREE SEO tool that will perform a detailed website analysis and provides clear actionable recommendations to improve your online presence and to rank better in Google search. HTML header. It shows the most important HTML elements like title, meta description etc..
Internal and external links. It gives both internal and external outlinks. Body content. It also lists out important body elements like headings, images etc..
Additional files. It defines the site robots.txt file and XML sitemap. HTTP headers. It shows the HTTP response of the URL. Social media signals. It displays the number of shares for the URL on social media. Domain and server. It gives information about the page’s web server like IP address, name servers etc..
Do you want to know what is happening on your blog and thinking about how to improve your blog’s overall traffic? Then, give a try to Quick Sprout’s free SEO tool. It analyzes your website traffic by connecting to your Google Analytics account. You will get personalized website alerts every time there are website improvements. If Quicksprout sees any traffic improvement is possible, it sends you alerts so that you can perform changes very quickly. While continually making changes to grow traffic, Neil Patel’s marketing experience helps you learn every detail like what, why and how. If you want to know what’s happening on your website and how to improve your website to grow traffic then QuickSprout is the tool for you. It’s time to save your website from thin content penalties. Thin content means having little or no original content. There are some webmasters tries to improve their page ranking and attract visitors with absolutely no original content. And, Google takes serious action against such domains. So, when you receive any penalty message from Google, start diagnosing the problem or you can take the advice of any SEO specialist. So, always produce unique and highly detailed content. Well, you have a a real hard work to bring lots many visitors to your site. But what if your backlink strategy doesn’t work. Any broken or dead links harms your website really badly. Firstly, it gives a very bad user experience. For example, when a user clicks on any link and if it shows 404 errors, then it frustrates user and will never return. Secondly, broken links restricts the flow of link equity throughout your site. It impacts rankings negatively. You can find broken links on your website and fix it with the help of these tools. Did you know that Google starting to penalize sites that are using pop-ups? Here’s the source. If you are still using popups avoid them at all costs or it could badly affect your SEO. In a study conducted by SimilarWeb, it was revealed that 56% of the website traffic to leading websites is coming from mobile devices. It is the need of the hour to avoid mobile pop-up penalty.If you are using pop-up for cookie permission or age verification then yes you are using it right. But if you use pop-up for disruptive purposes then get ready to face Google penalty in 2018. Never rely on unsupported software. See that your content is easily scrollable. Do optimization for local search. Make sure that all mobile-text is readable. Remember, mobile devices can be very sensitive platform for content. So, make your site mobile friendly. These days, it has become common to hack websites. Most of the websites are compromised all the time. However, the reason for most of the security breaches are to use your server as an email relay for spam or to setup a temporary web server. Always keep your software up to date. If any website security holes are found in software, it becomes so easy for hackers to hack your site. But if you are using a managed hosting solution then you need not worry about doing security updates as the hosting company takes care of everything. SQL injection attacks. An attacker uses a web form field to gain access and then manipulates your database. Attacker can easily insert rogue code into your query and can change the tables information in your database.You could fix such queries by explicitly parameterizing it. Passwords. Yes, we all know to use complicated passwords. It is very important to use such strong passwords to your server and website admin area. You should insist the same for your users too to follow good password practices to protect your user accounts. You can use hashed passwords which are highly impossible to decrypt. Backlinks have a great role in the world of SEO. To get quality backlinks, some bloggers buy backlinks but if you buy bad backlinks the Google penalizes your site very heavily that sometimes recovering from such penalties is not at all possible. How to find such bad backlinks? Just check the quality of the website. Bots populate comments saying, great info, very helpful etc.. Comment spam links are bad for your site. Find the contact details of the website owner and request him politely to remove the links that you don’t want for your website. If there are too many backlinks on your site then you can disavow these links. You can use tools like SEMrush to easily audit your backlink profile. Technical SEO is NOT hard as it sounds. But ignoring your technical SEO can really hurt your search rankings. If you are someone who’s looking to get more search traffic to increase your website sales, focus on what’s missing and find out how your site is performing on Google search results. Here’s where the detailed technical SEO guide which you’re reading now helps you a lot (both in terms of money and time) in fixing your site search traffic. So what are your thoughts? Did you find this technical SEO guide helpful? Do you have any more questions? Please let us you know your thoughts in the comments. Hi Anil , Thank you for your post. this is useful advice for SEO marketer. We all know that now a days , lot of marketer doing SEO work. So thumbs up on this post. Thanks for sharing this insightful article. until next time . Love to read your next post. GodBless!! Hi Anil, Thank you for sharing with your article. So basically, technical SEO just refers to any SEO work that is done aside from the content and it’s laying a strong foundation to give your content the best chance it can have to rank for relevant keywords and phrases.This is a comprehensive post 🙂 . Once again thank you for sharing with us . Nice post, Anil. Technical SEO is hugely misunderstood by majority of people. Hitting it right is like hitting the bulls eye. Making your site mobile friendly is a huge deal that people rarely focus on. It can instantly increase your SEO rankings. Faster webpage loading is also a huge deal breaker. People don’t want to come to slow loading websites. It’s that simple. Can I Use Screaming frog and Google Web Mastertool together. Till date i have read about off page and on page optimization. Thanks for sharing insightful article. Hello, Anil first of all thanks for this insight guide on technical seo. I think the two most important things in technical SEO for 2017 will be 1 mobile friendly and 2 https. I am sure that I had heard many industry leaders and googlers had said this two things over and over fo last year and a half. Anyway really love the way you cover the whole topic will be looking forward to seeing more from you in the future. This is pure gold, Anil. It’s a bit overwhelming for some, but that’s even more reason to undertake these tasks as soon as possible. The fact that they’re so technical means they are that much more important in the long-run. I haven’t looked into HTTPS, but thats my next step to ensure everything is smooth on my end. Oh, and thanks for letting me know about Screaming Frog; it looks very promising to run on occasion. I only wanted to ask what you think about using SERPstat for backlinks? Thanks Anil Agarwal sharing an awesome article about Technical SEO. I have to check tehncial part of SEO on our website.